GERMANY: A hollow concrete sphere has been installed on the bed of Lake Constance (Bodensee), on the southern German border, to test a new pumped storage design for offshore wind energy. The prototype project is installed just a few hundred metres from the shore of the lake resort of Uberlingen in Baden-Wuerttemberg, Germany. The concrete sphere forms part of a prototype storage system being piloted in a trial that ends next month and is being led by the Fraunhofer Institute IWES and German engineering and infrastructure firm Hochtief Solutions. 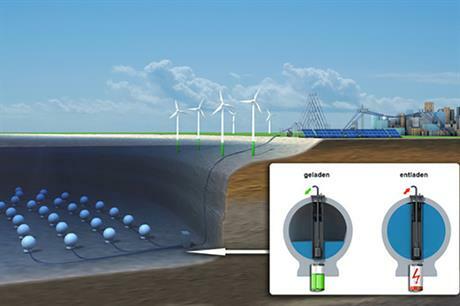 Physics professors at Goethe University Frankfurt and Saarland University in Saarbrucken developed the concept of a submerged pumped-storage device several years ago. The storage device consists of a concrete sphere with an integrated electric pump. The 1:10 scaled model in the pilot is 12 cubed metres, giving the sphere a diameter of three metres. A full-scale system would be 12,000 cubed metres, with a diameter of 30 metres. The capacity of the scaled model is around 3kWh, while the full-scale storage capacity is just under 20MWh able to provide 5MW of power. Fraunhofer IWES head of marine energy, Jochen Bard, said: "Those numbers, which are pure consequences of scaling laws, might look tiny, but the point really is to actually build and test a fully functional model. What can be learned at a small scale can save time and money as you move on and it de-risks the entire development process." Installing the spheres in deep water takes advantage of high water pressure in very deep water to store electrical energy, by pushing water into the spheres. The prototype undergoing tests in Lake Constance is 100 metres deep, although a full-scale version would sit in depths of at least 600 metres. To store energy, water is pumped out of the sphere using the electric pump. To generate power water flows through a turbine into the empty sphere and produces electrical energy via a generator. Trials on the sphere will address aspects such as design, installation, configuration of the drive train and the electrical system, operation and control, condition monitoring, as well as dynamic modelling and simulation of the system as a whole. The project partners have started to look into potential offshore wind hubs, serving offshore wind development sites in European waters. One potential location includes placing the commercial-scale version of the sphere in the Norwegian Trench, which is deep enough and has potential grid connections. This would allow the partners to explore the impact on power balancing, grid stability, offshore grid design and economics of the grid operation. Depending on the storage requirements of an offshore wind farm and the size of the wind farm, the capacity of the storage facility can be adjusted, with as few as five or as many as a 150 spheres installed, giving the system the advantage of being modular. "If all goes well we could be see a full-scale project emerging around 2020," Bard said.